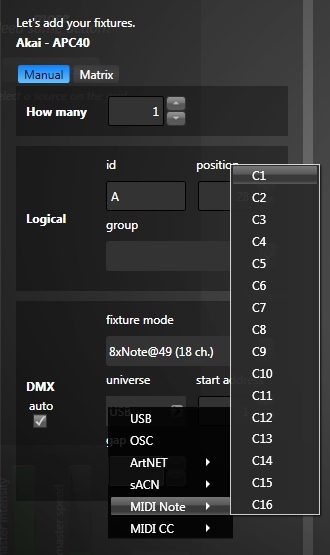 Live and flexible control of your DMX lighting fixtures with MIDI controllers is now a reality. Lightjams customizes your MIDI to DMX mappings in a very unique and powerful way. Multiple MIDI controllers can talk to Lightjams at the same time, including keyboards, launchpads, pedals and drums. Using backing tracks or click tracks also work pretty well. The great Yeasayer are using Lightjams in their 2016 tour! Nick Foligno from Union Garage Productions in NYC created the whole lighting setup for them. Everything is triggered via MIDI and the band can easily modify and create new lighting scenes using the DAW they're used to. The dedicated MIDI tracks they made for the lighting ensures it's in sync with the music. The amazing drummer Razor Tongue (Larry Hundertmark) from the band Plague Of Locust made this demo video showing how he uses his MIDI drums (Roland SPD-SX) and Lightjams to trigger lighting effects in realtime. As you'll see, he's fast. I mean really fast. Still, the lights are synced very precisely. Here's a project by LightUp using 54 DMX universes and two computers running Lightjams. MIDI has been used to keep everything in sync. Lighting Designer, Nick Foligno from Union Garage Audio designed and ran this light show live to the music of Brooklyn band, The Vandelles. He used a MIDI controller (Akai APC40) to activate cues and designated 'hot' keys for special effects like strobes, floods and fog. Everything is controlled via Lightjams. Want to play lights with your MIDI controllers? DARE TO LIGHT gives us a nice artistic performance featuring a keytar player controlling lighting through MIDI. The performers play with the lighting as they play music. Lightjams becomes a lighting instrument expanding the possibilities of live performances, freeing artists from having to strictly follow pre-recorded cues. DARE TO LIGHT also posted a tutorial video showing how to setup the whole thing. Here's another rehearsal video with a MIDI keyboard and again, some DMX lights and real talent. As you'll see, there's no delay between the time a key is pressed and the lights are activated. The MIDI input is going really fast and can keep pace even with the speediest musicians. Unleash the power of MIDI control and note messages and really control any Lightjams parameters in a few mouse clicks. If remote control is your goal, you'll be served! Lightjams can send back the 16 channels of MIDI notes and cc to control other software or generate feedback with your MIDI instruments. The MIDI output configuration is very powerful and you can generate very sophisticated feedback. For precise synchronization, Lightjams can receive MIDI clock messages enabling you to use the BPM info and react perfectly in sync to the beats. MIDI time code (MTC) is also supported. Drum pad launcher, mixer, keyboard, pedal, name it. Lightjams supports it. Create a real jam by letting multiple people play together! Access the MIDI configuration by going to View/Configuration. Lightjams automatically detects connected MIDI controllers at startup. You should see the connected controllers in the list. Use: If you don't want Lightjams to use a MIDI controller, just uncheck the use box. This allows another application running on the computer to use the controller. Connect & Refresh: The refresh button looks for newly connected MIDI controllers. So to add a controller, just plug it in your computer and hit refresh. To receive MIDI from another software running on the same computer, you can use a virtual MIDI driver like loopMIDI or LoopBe1. To send MIDI from your Mac and receive it in Lightjams running under Windows, look at rtpMIDI or ipMIDI. Select any slider and click on the MIDI icon. Then you'll be able to play with all MIDI settings. Notes & Controls: Select whether you're interested in notes or control changes (CC). Channel: You have access to all 16 MIDI channels. Values: The viewer at the left lets you see values in realtime and easily choose the value you want. Just click a value to select it. Last received message: This is a type of MIDI learn feature, helping you quickly map your MIDI messages. The last received message, from any channel and of any type, will appear on the top-right button. Just click the button to select the corresponding MIDI message. 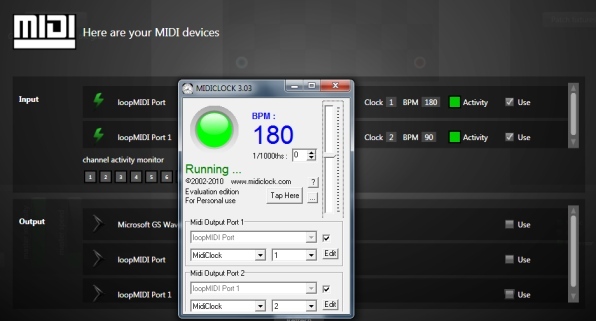 Each MIDI input controller can send clock messages. Lightjams then extracts the BPM info and you can use the following functions in your formula: midi.clock.beat, midi.clock.bpm, midi.clock.sawtooth, midi.clock.speed. The clock ids are automatically assigned by Lightjams. You control the LEDs of your MIDI controller like any other lighting fixtures: simply patch them in the MIDI Note/CC universes. You have 16 universes for the notes and 16 universes for the cc, each universe corresponding to a MIDI channel with 128 elements. 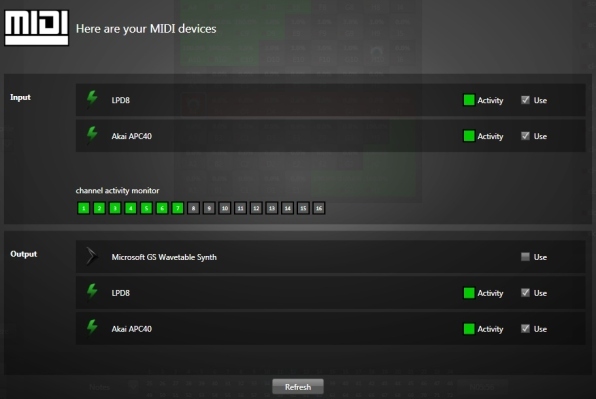 All active MIDI controllers in the output configuration panel will receive the MIDI messages. Let music performers control lighting parameters with their MIDI music instruments. Let the lighting crew generate live lighting effects in a really unusual way. Close your computer lid and use a MIDI keyboard to trigger your lighting effects. Map MIDI notes coming from your favorite music software and trigger lighting effects.